Isn’t it cheating to put a motor on a bicycle? Only if you use it for trips that you could enjoy, or learn to enjoy, on your own power alone. We think you should use a regular bike for those trips, as we do. A worse form of cheating is using a multi-ton vehicle for work that Stokemonkey makes easy, while flattering yourself that you are too strong and pure a bicyclist to use a motor. Hub motors are simple, popular, and most are cheaper. What’s Stokemonkey got on those? Torque, for climbing steep hills with passengers or heavy cargo! 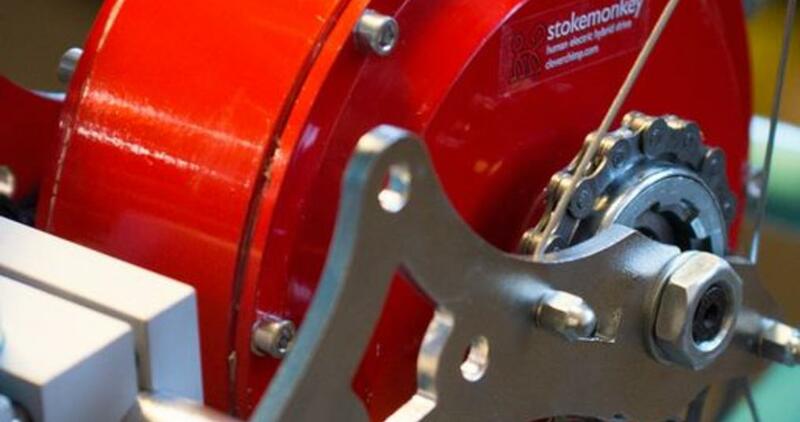 Used with common MTB gearing, Stokemonkey can put out more torque than any bike hub motor we know, about four times that of common ones, more than twice as much as early VW Bugs (~110lb-ft/150Nm)! That’s the main functional difference. Quiet, high efficiency at all speeds, lack of drag when pedaling normally, and unlimited choice of wheels are other upsides. If most of your riding is cruising along in mild terrain, without big loads or lots of starts and stops, a hub motor may well be your most cost-effective choice. What about other variably geared approaches on the market? You have choices. Other through-the-gears assists are a few pounds lighter with equivalent batteries, for about 2% lighter gross weight (rider + bike) before passengers or cargo, when the difference may fall below 1%. They're lighter because they use much smaller motors operating at much higher speeds to produce similar power levels, which must then be geared down a great deal before coupling with your bicycle’s drivetrain. These many high-speed internal moving parts make a lot of noise, at least if your frame of reference is a bicycle or a ceiling fan and not, say, a motorcycle or a cordless drill. These parts are subject to wear, and not as widely available and easily replaced as Stokemonkey’s few, bicycle-standard wearing parts. These more proprietary approaches also tend to constrict the range of gearing available to the motor, to you, or to both. There are workarounds, such as using a wide range hub gear like a Rohloff, but this isn’t without its own costs. Does it charge as you ride it? No, it doesn’t generate any electricity. Stokemonkey’s use of your bicycle’s gearing yields far higher net efficiency than the regenerative braking schemes used in some other products (or their marketing material), and the two approaches are mutually incompatible. Can you use it in the rain? Of course. Mud and snow are good too. Try not to immerse it. You should plan on taking the battery inside for charging if the bike has to stay outside. Will it work with a regular bike? We don’t support it for regular bikes. Stokemonkey was conceived as a longtail cargo bike accessory, not a generic e-bike kit. There are too many bicycle design variations to create a safe, reasonably universal mount for Stokemonkey. Meanwhile, there are already a number of electric bike products for those who do not require the exceptional capability that longtails and Stokemonkey offer together. Stokemonkey is designed to deliver more low-end torque than anybody could want without heavy cargo. Apart from providing Stokemonkey a mounting point and clearance in front of the rear wheel, longtails provide a superior place to carry one or many battery packs, while still leaving plenty of useful cargo space. The extra wheelbase improves handling with heavy loads and at high speeds, permitting you to remain seated on the steepest climbs that would cause the front wheel to lift on ordinary bikes. Will it work with a recumbent/trike/quad/tandem/ute/bakfiets/madsen/velomobile/unicycle/pedicab/hovercraft…? See above. Stokemonkey is designed to work with longtail bikes as described in the compatibility notes. In all other cases, fitting Stokemonkey means embarking on an engineering adventure whose success cannot be guaranteed. We can’t provide much if any remote support, nor will we extend our warranty for experimental installations. That said, Stokemonkey has been successfully adapted to a number of special vehicles including recumbent trikes, more than one velomobile, some pedicabs, bakfiets-style cargo bikes, and we were happy to provide what support we did in these cases. Skilled riders will have no trouble using Stokemonkey immediately. It takes between a few moments and a few hours to become accustomed to the sensation of driven pedals, and to add throttle control to one’s existing shifting skills. If you have trouble changing gears smoothly and appropriately to maintain reasonably steady pedaling speeds as you start, climb, cruise, and descend, you’re not ready for Stokemonkey. Many riders habitually shift to a very low gear and spin the pedals rapidly as they climb the steepest hills. Yet Stokemonkey provides maximum power at lower pedal speeds. We have witnessed cyclists pedal up staircase-steep grades with Stokemonkey at cadences higher than 120, complaining that the motor wasn’t helping much. It can take a bit to learn how to let Stokemonkey do the hardest work. Stokemonkey installations conform to US federal Consumer Product Safety Commission rules for electric bicycles. These federal rules pertain only to safety standards required of vehicle manufacturers, and may or may not be reflected in your local laws governing bicycle use and access to facilities, which may allow higher speeds, or may outlaw motorized bikes altogether. Local laws vary, and are frequently difficult to ascertain and interpret for unusual vehicles. For example, some laws describe motorized bicycles only in internal combustion terms, while others refer to speed under motor power alone — which is not a normal mode of Stokemonkey use. Ultimately, you are responsible for knowing your local laws, configuring Stokemonkey, and operating your bike in a safe, responsible manner. Because Stokemonkey is virtually silent and you pedal normally, it is unlikely to attract unwanted legal attention. Doesn’t the extra weight cancel out the benefit of the motor? We usually answer this question by offering to haul the person asking up a nearby hill. Your local bicycle shop has all the tools and skills required to install Stokemonkey. In many cases, home mechanics will be adequately equipped, too. If in doubt after reviewing the installation instructions, take it to a shop! Unfortunately, many bike shops have had bad experiences with other electric bike products, and others may profess support for exclusively human-powered vehicles, turning you away to contemplate the car racks they sell, their parking lot, etc. You have been warned. It may help to assure them that Stokemonkey works similarly to a tandem bicycle, using only standard bicycle drivetrain components, and that no electrical expertise is required.